Thank you for choosing The Community Plate Catering! When planning your event, remember that our menu acts as the blueprint of our company. We take great care in providing great menu options that will surely make any occasion special. Please feel free to look over our menu, however, do not limit your thoughts to what you see. If you would like to mix and match, omit ingredients, add ingredients, or make anything a special way, please do not hesitate to ask. We will do our absolute best to accommodate your needs! 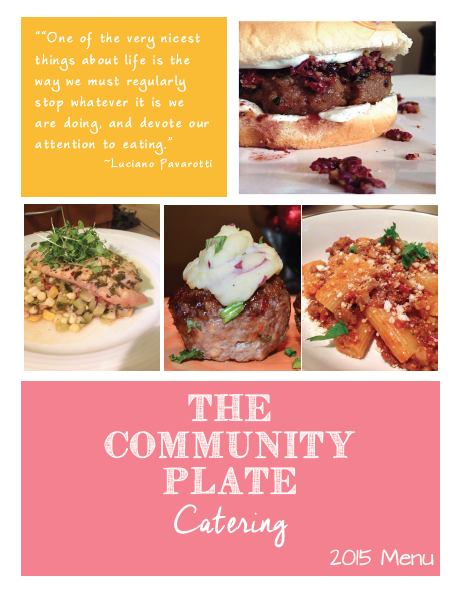 Please email christina@thecommunityplate.com for inquires about availability, menu questions, additional options, or any other questions you may have. Currently, we accept cash, personal check, money order, or PayPal services. We also request all orders to be paid in full before delivery/setup. Caterers:What do You mean Caterers, Caterers Service is most important part in Wedding, not only the wedding more function like B'day bash, Events, Office Parties these are most important life Events So Do Caterers work for you. You can always upgrade your commercial with the help of kitchen catering equipment suppliers that has an online store, so you may get the selective items delivered to you quickly. Great article on catering business. Catering business is the best choice. I really impressed for your work. Thanks For sharing this article. Wow! Such an amazing and helpful post this is. I really really love it. It's so good and so awesome. I am just amazed Commercial Refrigeration.